So I limited Plastic Pitch to 12 tones per octave to take advantage of the muscle memory that every keyboard player already possesses, but I gave each of the tones an independent pitchbend setting. This allows the player to tune each of the 12 notes according to however the pitchbend range is set on the connected MIDI synth. For example, if the synth’s pitchbend range is set to 2 semitones (a whole step), then the knobs on Plastic Pitch range from down a whole step to up a whole step. Change the pitchbend range on the MIDI synth, and the knob range changes accordingly. 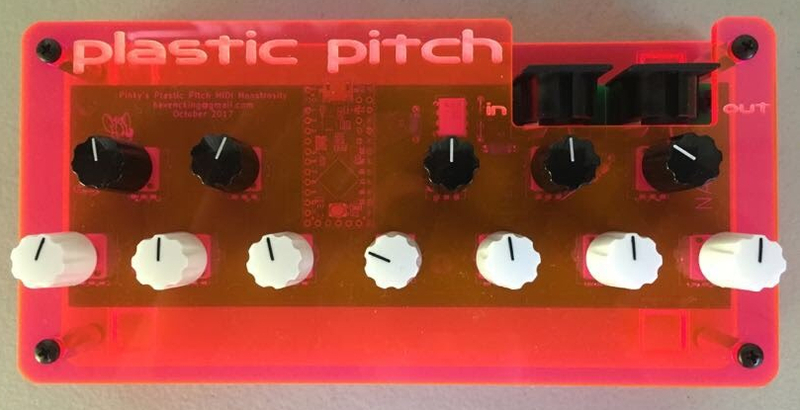 Another design consideration that is different for Plastic Pitch is that I opted for what I would consider more of a musician’s approach than an engineer’s approach to microtuning. An engineer might approach microtuning as I did with my previous device by using very precise pitchbend values that are carefully calculated to match specific numeric frequencies. In contrast, I kept the interface simple and immediate. Simple because the only indication of relative tuning is the line on each knob. Twelve o’clock is neutral, left is down in pitch, and right is up. And, immediate because tunings can be changed dynamically while playing in response to what is heard, not unlike how a violinist, for instance, makes small tuning adjustments as they play. Am I just destroying all that is good about music? I don’t think so. My initial pursuit into microtonality was inspired by the book Tuning, Timbre, Spectrum, Scale by William Sethares. It presents a methodology that relates timbres to musically interesting microtonal scales. The common 12-tone equal temperament (12-TET) scale works fine for timbres that are rich with harmonics, like the ones produced by all the traditional Western musical instruments. However, if timbres are chosen that feature prominent inharmonic spectral content–gamelan is one example in the book, then a scale other than 12-TET would be more musically suitable for creating the interplay between consonance and dissonance that often characterizes tonal music. The book has computational methods for coming up with possible scales for a given inharmonic timbre. That is great for approaching microtonality as an engineer, however, as noted above, Plastic Pitch is an attempt to approach this differently, perhaps as a musician. Here are the schematics, parts list, and Teensy code if you’d like to build you own. Please contact me with the form on the right sidebar if you’d be interested in purchasing parts, a parts kit, or even a fully assembled one. I am not sure about prices, but I’ll see what I can come up with if others are interested. I for one would like to hear more microtonal music. It has two standard MIDI 5-pin DIN ports, one IN and one OUT. The IN port listens for MIDI Note On (key press) and Note Off (key release) events from any MIDI channel. The OUT port sends Note On, Note Off, and Pitchbend events on the first twelve channels. All other MIDI events are ignored. When playing a monophonic or non-multitimbral polyphonic synth, only the pitchbend for the last played note is used. This is possibly a feature or possibly a problem to workaround depending on perspective. The simple workaround is to only play one key at a time and not hold down multiple keys. Or, do hold multiple keys, and get unpredictable pitch behavior.